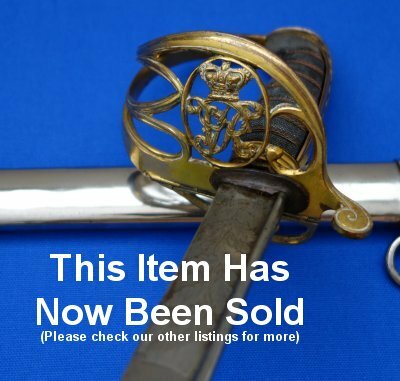 In very good overall condition, an 1822 pattern British infantry officer's sword but for an officer in the Honourable Artillery Company, so etched and with the original owner's name. 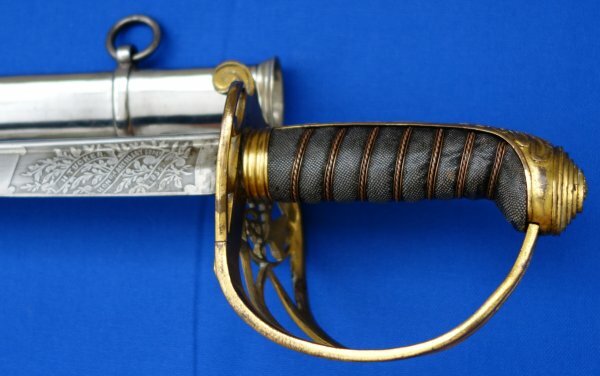 It is rare to find an 1822P in such good condition and even rarer to find one etched to the British Honourable Artillery Company; this one even has the original officer's name etched to the blade; "H Tucker Honble Artillery Comy 1855". This is unlikely to be a presentation sword but the one H Tucker carried, as it was normal for HAC officer's to embellish their blades. The pipe-backed quill-pointed 32 3/8 inch blade is in very good condition, some patina spots but not too many, and is form in the hilt. The gilt on brass hilt has a little bending damage, as is common, but not too much. The fishskin grip is very good and the twisted copper grip wire bindings are complete and set the sword off very well. The field steel scabbard in in very good condition. The sword sheathes and draws well. 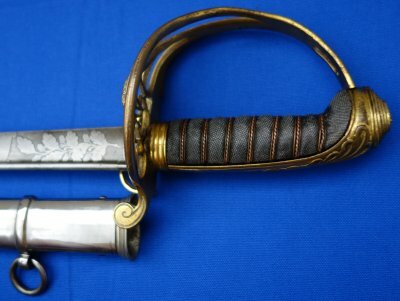 A really lovely sword for just £500. Please quote item reference J49 (1138). Further / full sized images available upon request.